Wayne creates toasted coconut marshmallows, shrimp salad and an Asian London broil for his guest to enjoy while watching the show. No matter where you plan on watching the Air & Water Show this weekend, here are three dishes perfectly themed for a viewing party. I’ve created lighter than air toasted coconut marshmallows, a summer fresh shrimp salad and an Asian salad with a mustard marinated London broil. All three dishes will travel well and can be served cold or at room temperature. Watching the show from the water is actually a treat. I was giving a sneak preview from my friend Tim Schneider just last week on his boat, Dreamscape. You can see the video of that visit along with a demonstration of the shrimp salad down below. 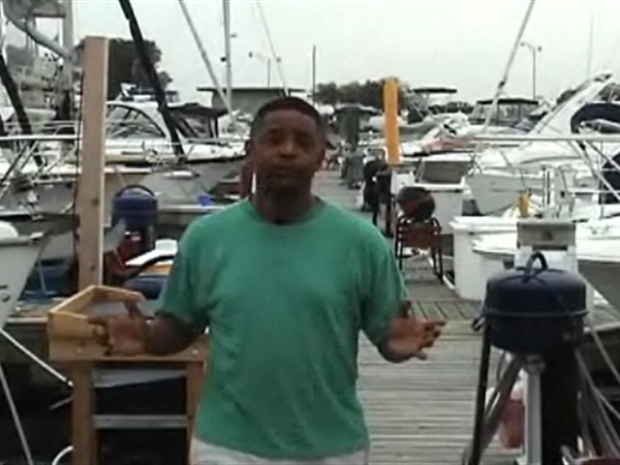 Wayne Johnson has the perfect recipe to spice up the Chicago Air and Water Show. 4 oz Fresh Snow Peas, stems peeled and then cut crosswise. Mix together marinade ingredients. Place steak in a large sealable bag and pour marinade on top. Squeeze out as much air as possible and massage ingredients into through the bag to distribute all over steak. Marinade steak in the refrigerator for 1 hour or longer. Remove from the refrigerator 30 minutes before broiling. Make pasta according to package directions and then drain and rinse with cold water to stop the cooking process. Toss with 1 teaspoon of sesame oil and set aside. Turn on the broiler and set the rack at about 3-4 inches from the heat. Remove steak from the bag and place it on a pan. Broil for 4 - 4 1/2 minutes per side*. Remove from heat and allow to cool. Thinly slice the meat across the grain and at an angle. Set aside. Put coconut milk, chicken broth, peanut butter, soy sauce, worchestershire sauce, lime juice, ginger and garlic in a pot over high heat. Finely chop half of the basil and add it to the pot as well. Bring to a boil and simmer over medium low heat until mixture has reduced to about 1 cup of liquid, about 6 minutes. Remove from heat and allow to cool completely. Pour over pasta. Roughly chop remaining basil leaves and add to the pasta along with the snow peas, carrots, bok choy, green onions, and red pepper flakes. Toss to combine. Add sliced beef and toss again. Garnish with fresh basil. * Broiling time will vary greatly depending on how close to the heat source and how think the flank steak is. Your goal is medium rare. Put coconut in a large dry skillet over high heat. Stir constantly until coconut is lightly toasted throughout, being careful not to let it burn, about 6-8 minutes. Pour coconut on a sheet of parchment and allow it to cool. Meanwhile, mix together powdered sugar and cornstarch. Lightly spray the sides of an 8” or 9” square pan with cooking spray. Pour a generous amount of powdered sugar mixture in the pan and tilt it to coat all the sides. Pour excess back into the rest of the powdered sugar mixture. Pour half of the coconut mixture into the bottom of your prepared pan and set aside. In a small bowl, mix the gelatin with 1/2 cup of water. Set aside. In a large pot, mix sugar, corn syrup and the remaining 1/2 cup of water. Bring to a boil and stir until mixture reaches 240 degrees on a candy thermometer. Pour gelatin mixture into the bowl of a stand mixture with the whisk attachment. Carefully pour hot sugar mixture into bowl. Turn on mixture and gradually increase it to the highest setting. Whisk ingredients for 15 minutes. Pour in almond extract and whisk for a few seconds more. Immediately pour (or scoop) mixture into the bottom of your prepared pan. Wet your hands completely and press mixture into the corners of the pan and even it out on the surface. Sprinkle remaining coconut on top and press hard to flatten it out. Let the mixture cool at room temperature, uncovered, for at least 4 hours. Once cooled, run a knife along the sides of the mixture and remove it from the pan onto a cutting board. Using a sharp knife, cut the marshmallow into strips. Dust the cut sides in the powdered sugar. Cut the strips into squares and dust the new cut sides in powdered sugar as well. Bring a large pot filled with water and 2 tablespoons of salt to a boil. Drop shrimp into boiling water for 3-4 minutes. Remove and put shrimp in a large bowl of ice water for 2-3 minutes. Drain and pat shrimp dry. Place shrimp in a medium sized bowl and toss with cumin, lime juice and fresh dill. Set aside. In a large bowl, mix together corn, tomatoes, onion, red pepper, yellow pepper, green onion, cucumber and cilantro. Remove shrimp from lime juice mixture with a slotted spoon and add to salad mixture. Add red wine vinegar to lime juice. Whisk mixture and slowly pour in olive oil until it is emulsified. Pour over shrimp and vegetables and toss to combine. Season with salt and pepper to taste. Serve shrimp salad over Romaine leaves in a large serving platter or similarly on individual plates. You can substitute boneless skinless chicken breasts with this recipe if you like. Simply season the chicken with salt and pepper and grill until cooked through. Slice the chicken into strips then then coat them as described with the shrimp above. Also, as an appetizer, you can make individual roll ups with this salad. Take an 8” tortilla and line it with a piece of Romaine lettuce. Top with a medium sized portion of the shrimp salad. Fold the bottom over the lower part of the mixture; then roll the two sides over to seal.